We made rapid progress next day along the right lateral moraine. 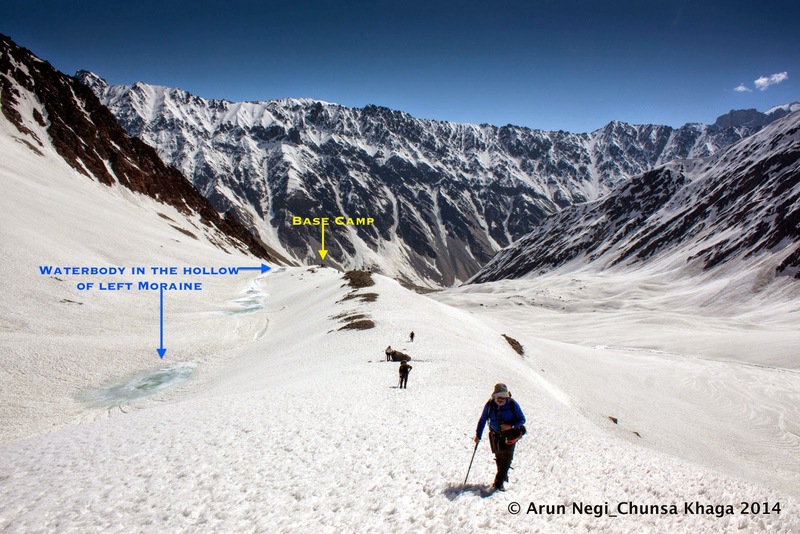 After about a kilometer we entered the massive glacial amphitheater of the Kalapani glacier at the middle of which gurgled the baby stream of Kalapani Nala (Bushaheri Nala as Tilak would say). Getting into the amphitheater required some step cutting to ensure safety for the laden porters. Though there was no crevasse danger in the area, the snow covered boulders made our progress rather slow. Crossing the Busheheri Nala required only a hop-over. Though the stream currently looked quite innocent, at some point in time it must have carried enormous power. As we had observed the previous day, just a couple of kilometers from where we stood now, this little river has gouged out a relatively new looking gorge almost 300 feet deep, right through the middle of the glacial fan of Kalapani. The progress was slow yet steady through the ever rising, steep and virgin snow slopes on the left bank of the Nala. In another hour we gained the tabletop of the left lateral moraine of the Kalapani glacier. As expected a small blue tarn greeted us at the entrance to the table top. We had noticed this tarn earlier in the Sat-recee. Located at the very end of the left lateral moraine, it is almost a permanent water body that collects snow-melt from the glacier on the plateau above all year round. We had found our Base Camp. With fully laden porters, we had managed the 6 Km trudge and the altitude gain of 600 Meters in just over 4 Hours.The weather turned for the worse as soon as we pitched camp and remained so till about midnight. A bright morning next day beaconed us to move station to the Advance Base Camp, which we had planned to have at the head of the lateral moraine and at the foot of the pass. Even though we were a short scramble of three kilometers away from the Advanced Base Camp, we had not yet had a glimpse of our objective. We were just pushing on blindly following GPS and the landmarks. After about an hour of steady climb on the lateral moraine ridge we came to the head of it where it merged into a minor buttress coming out of the bounding ridge to our right. The left moraine thinned out into a bottleneck at this point as visible from a distance. We had no option but to go over it following a steep zigzag across an exposed slope of virgin snow. Another hour and half a kilometer of frustrating climb later, we finally gained the top of the buttress; a huge convex hilltop. Right ahead to the West was the Chunsa Khaga. 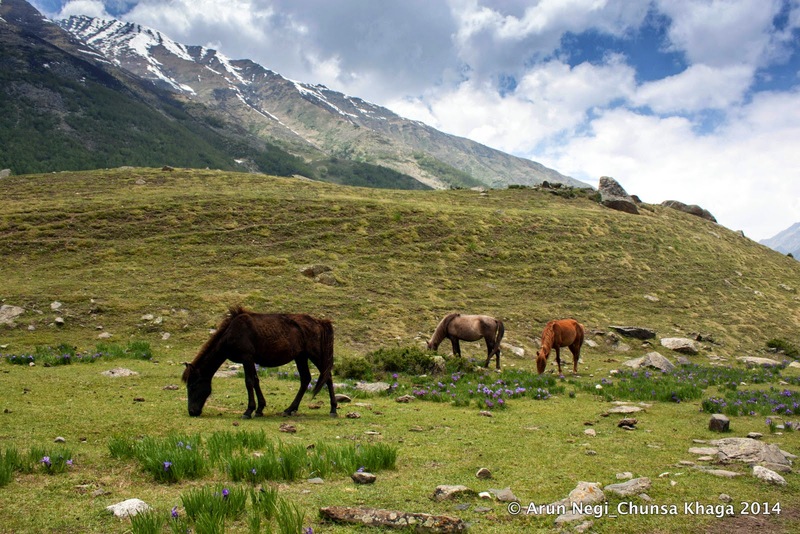 Its twin sister, the Chunsa Khaga (South) was nestled prettily to its left beyond a rocky pinnacle. Technology had delivered yet again. We had almost blindly navigated through the whole of the Upper Chor Gad and Kalapani valleys, our only eyes being the Garmin handheld, and here we were standing right at the feet of a rather friendly looking objective! We were seeing it for the first time even as we almost emerged from under its little toe!! The weather predictions had been correct, the terrain monitors had been correct, the sat images and landmarks had been correct and the GPS had tracked geo-data with absolute accuracy in all weather conditions. These were signs that the mountain was in a mood to let us in. What all would the likes of Gerard, Hodgson, Herbert, Shipton and Tillman have achieved if they would have had access to such mind-numbing technologies?! I reflected for a moment. It was a humbling thought. That evening we set up the prayer flag that the Old Jadh at Uttarkashi had handed over to us. Negi, Nitin and few others laboriously secured anchors for the flag and set it up upon a conspicuous hollow with a steady traffic of wind. It felt nice, keeping our promise to the old man. The scene around was surreal. Giant 6000ers of the Nelang and adjoining valleys dotted the east and southeast horizon. 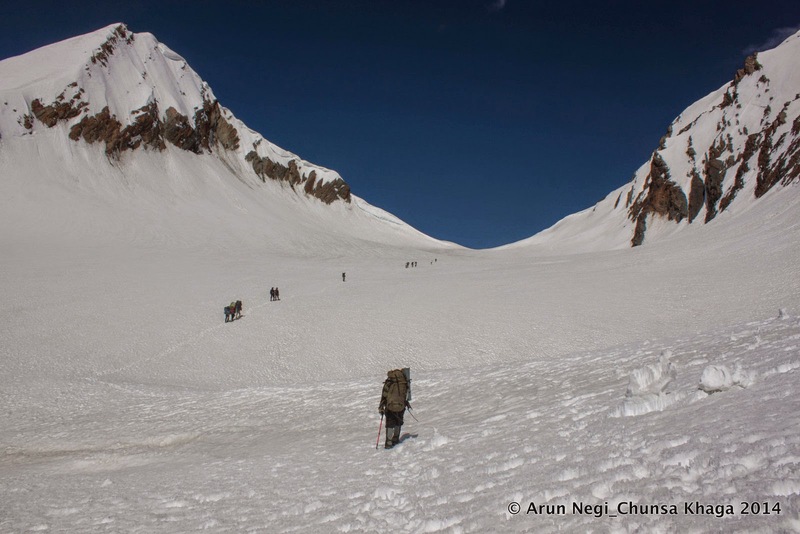 Pk Nakurche (6010M), our objective of the previous year, dominated the skyline being the closest. Towards the west, the twin passes of Chunsa Khaga North and South were looking glorious, their surfaces shining a metallic gold as the snow-melt deflected the setting sun. As soon as the sun went down the moon shone bright but the intense cold drew us into the warmth of the sleeping bag. Sleep was not easy in all that cold and anxiety…. The pass had yet to be crossed and the descent on the other side was still an unknown factor. But the weather was good and the spirits were fine. “In any case we should be able to handle a technical descent if push came to a shove”… I went to sleep ruminating over all different permutations of possibilities. The ascent to the pass involves a sharp climb first till a place where the Kalapani North Glacier takes a sharp tumble down. Then the ascent tapers off to an easy gradient. This inflection point where the gradients change was an important part of our route plan since this is where we expected the few crevasses on this side of the pass. Thankfully the potential danger areas were well marked on the GPS and visually confirmed the previous day. We thus planned a route keeping close to the left of the glacier at the foot of the bounding ridge to north. Near the point of inflection we steered diagonally to the middle of the glacier so as to avoid potential crevasses. Ahead was an easy incline along a valley-trough about half a kilometer wide. A small cloud cluster emerged over the dip in the ridgeline ahead clearly demarcating the pass saddle. For a moment my mind wandered off to a fleeting visual of a packed caravan of royal soldiers heading down from that top – dressed in thick woollens and leading down a train of Yaks. “That’s how it would have looked like in those days. Would they be looking spirited or saggy? Would they be freebooters looking forward to adventure and plunder or just duty-bound employees“. I was trying to keep my mind busy recreating the romance of a bygone era, perhaps to avoid focusing on the toil that was taking my breath out easily every few steps. Before long we reached the top of the saddle. Within about two hours of the commencement of the climb, the entire team was atop the Chunsa Khaga-5500M; just under 18000 ft (17900ft to be precise) as described by all previous accounts. We had made good time and still had at least 2 to 3 hours of walk left before the unstable afternoon weathers of the extreme altitudes start threatening our plans. The route looked good for the 5 Kms of descent coming up ahead through the snowfield. We could already see a bad patch of gaping crevasses about a kilometer away. It didn't look too big. From where we came, the Mt Nakurche shone bright on the horizon bidding us adieu. Farther one could make out the faint outlines of Sri Kailash and Kamet. As we looked ahead across the saddle of the pass we could see the sprawling expanse of the Head of the Baspa Glacier. The complex knot of ridges of the Gundar and Arsomang tributaries of the glacier were directly ahead and the westerly flow of the wide glacier was visible for at least five miles. “उतराई ठीक है Sir” said Vinod coming up from below the brown ridge on the far side of the saddle. He had finished the initial reconnaissance for the descent as the team slowly regrouped at the summit point. We had set up a large cairn on the brow of the brown patch of rocks that defined the Baspa end of the saddle. The little ridge we were standing on was actually the beginning of the 10-mile long East-West ridge that acted as the division of the water partings between Baspa and its neighboring valleys to the south. It was interesting to observe that the waters of the Chor Gad joined the Bay of Bengal whereas the waters of the Baspa eventually joined the Arabian Sea. The bed of virgin white snows on each side of declivity of the saddle were going to send out their waters to destinations that were going to be spaced apart by the entire width of the Indian sub-continent. The descent was not as difficult as we expected immediately after the pass. About a kilometer later we could sense a change in the profile of the glacier bed indicating imminent danger of crevasses. 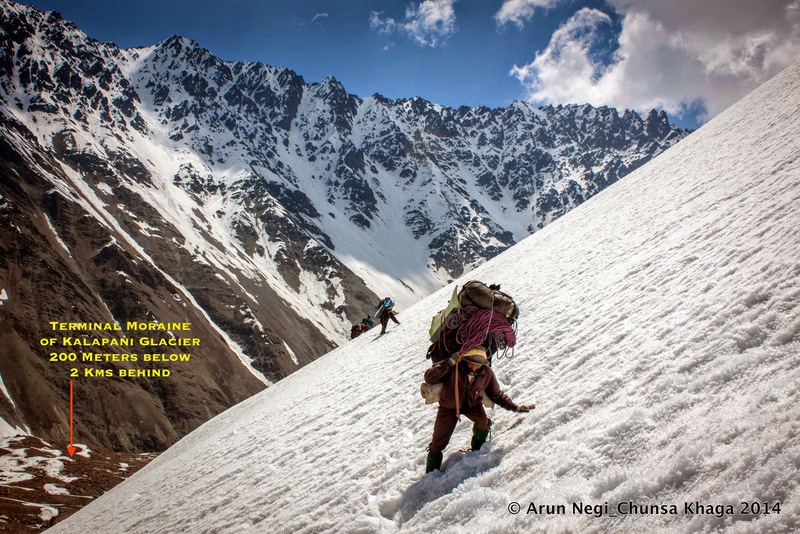 The team got organized into two ropes and followed a rib to the flat snowfields of the glacier down below. A couple of sinister looking glacial tarns with greenish-blue waters passed us by on both sides. The sun was beating down mercilessly and the ambient temperatures read a high 44deg Celsius! After another hour we un-roped having reached stable grounds. After 5 kilometers of traverse from the pass we finally reached the place where the Glacier bends away in a northwesterly direction. 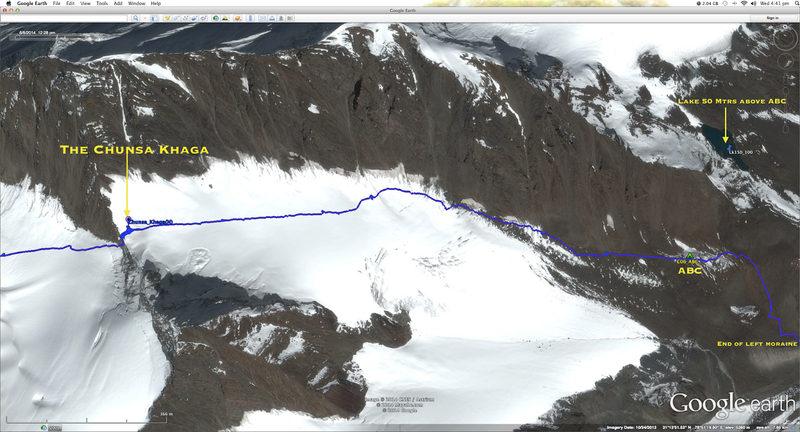 The waypoint on my GPS read “Baspa Glacier Bend”! (Baspa Gl Camp- Tributary glacier in background. 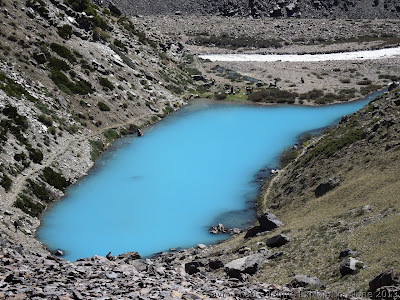 A little tarn was located nearby where a tributary glacier joined in from the true right of the Baspa headwaters. 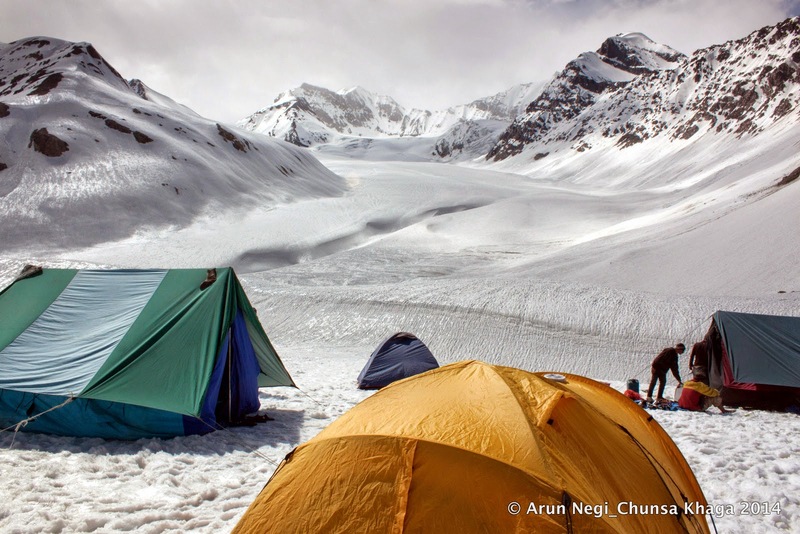 The glow of the setting sun upon that sloping tributary glacier created the perfect dreamy canvas for the camping of the triumphant team. We had pushed non-stop for the past 6 days and here we were past the biggest objective and obstacle. Only one last bit remained- that of traversing the length of the uncharted Baspa glacier with its steep avalanche prone sides, without any incident. While designing the route we knew that the right bank of Baspa Glacier was our safest bet for it had the longest unbroken surface, almost till one reached the snout of the glacier. 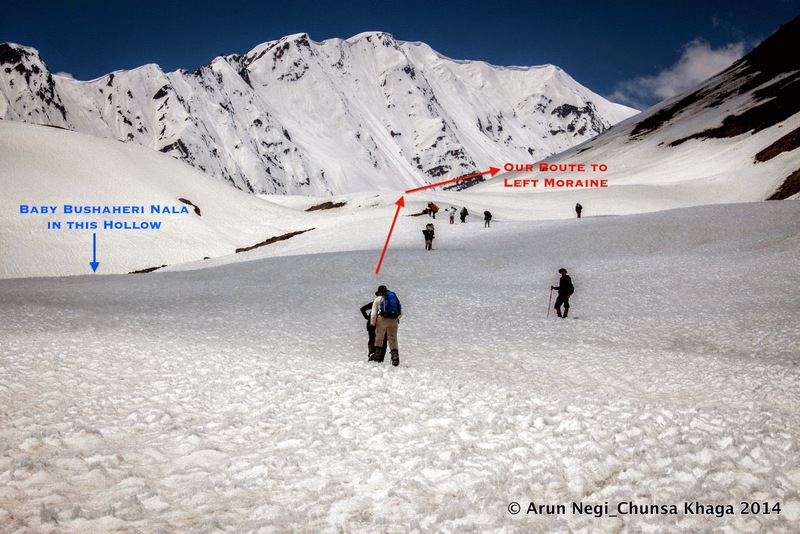 In contrast, the left side was not only close to avalanche prone sides but also was heavily broken for the last 2 kilometers of the glacier’s length. Also the right bank being a south facing side was likely to be more free from snow than the left. After 3 full days in snow we were itching to get back to normal grounds. About a hundred meters from the camp we saw the beginning of the little stream of Baspa, which slowly but steadily increased in its girth as we walked along. It went subterranean after a while where the mile long prominent medial moraine became visible. Within about 3 hours of our march we could see the outline of the Lamkhaga ridge junction indicating that the snout area was coming near. In the last 2 kilometers we could see the death throes of the Baspa Glacier as massive patches of open and broken glacier surfaces revealed the flow of Baspa beneath it. We could see the river fully exposed at least two kilometers above what is formally known as the snout of the glacier. In the last one kilometer or so it looked like a row of massive broken ice slabs standing in reverence on the two sides as the proud Baspa flowed in the middle in her erratic and confounding course. The day the two transverse ice barriers defining the snout melt away, the source of Baspa will suddenly recede by at least half a kilometer in one stroke! After the 14 Km long trudge over snow, rock and boulders we reached the snout around 1500 Hrs. A kilometer ahead was the Gaundar camping grounds; our objective for the day. The dry shrubs of the area allowed us a modest but nice camp fire that lasted late into the night. We were a relieved bunch having blazed our way through the icy regions in a single push without using any resting time. The last challenges of the Baspa valley remained to be tackled now- the swollen rivers all the way and the exposed slopes between Dumti and Ranikanda. Our immediate concerns were the two sizeable streams that were to be forded the next day- first the Gaundar Nala and then the bigger and more tempestuous Arsomang Nala. Beyond that lay the Nithal ITBP post- the deepest post in the Baspa valley and the first that we were to see on our way down. Thankfully a snow bridge over Gaundar Nala and a well-engineered bridge over the Arsomang Nala saw us through to Nithal Post in no time. Twenty odd men from the Army and ITBP greeted us on the high right bank of Baspa. The post staffing was relatively thin since a large detachment of troops had left for military-exercise near the Yamrang La, we were told. After the paperwork and reporting we had the customary photo-op with the jawans before we left for the ten kilometers of onward march to Dumti post. The river bed fans out wide after the Nithal post, the distance between the two banks gradually increasing to about two kilometers very soon. The massive flat in between is filled with grass, shrubs and rocks. Numerous springs emerge here on the riverbed and combine to form the clear blue waters of the Nithal Nadi, which merges with the Baspa with in about a kilometer. Before long we crossed the green meadows heralding the approach of Dumti as the Baspa narrowed down again before taking a giant sweeping turn to skirt the remains of a long dead glacial fan coming down from the Rangrik Rang massif. Upon this flat glacial fan the Dumti post is located. Across a stream we saw a small group of people who seemed to be waiting for us. It looked like we had a welcome party from the ITBP ready with ‘chai’ refreshments (tea and biscuits). Nearby was the Karu Devta temple – the presiding deity of the Dumti area. Legend goes that once Fredrick Wilson of Harsil had travelled to Dumti around circa 1881 and here he fell seriously ill[i]. A goat then had to be offered to Karu Devta before he instantly recovered- writes S J Stone in his 1891 memoir[ii]. “श्रद्धा की बात है जी. उनकी पार्टी भी हो जाती है शायद” replied the senior looking tall man in the welcome party with a heavy Haryanvi accent. Looked like Karu Devta had pretty sanguine tastes and everyone seemed to be convinced about the morality of it. We had a reasonably high-powered welcome committee comprising of the #1 and the #2 officers in-charge of the post, two very amiable gentlemen full of stories of their exploits. They were the epitome of hospitality during the next 18 Hours of our stay there. We were ushered into a “Guest House” of the post, which has been a recent addition. Two well-carpeted rooms with beds, a Siachen-sleeping Bag and an attached western-toilet completed the do. We even had choice of hot water for washing! It was Star-luxury for us after more than a week of camping in high snows. All the food that came our way from the Langar was hounded off swiftly. The simple “dal- chawal- sabzi” fare suddenly tasted amazingly delicious! We were evidently bored out of the repetitive taste of the camp kitchen. Dillip, the camp cook, did not look very amused with our zesty enthusiasm. During the idle discussions in the evening, the familiar sadness of having to go back to the fleshpot of the city had begun welling up inside. 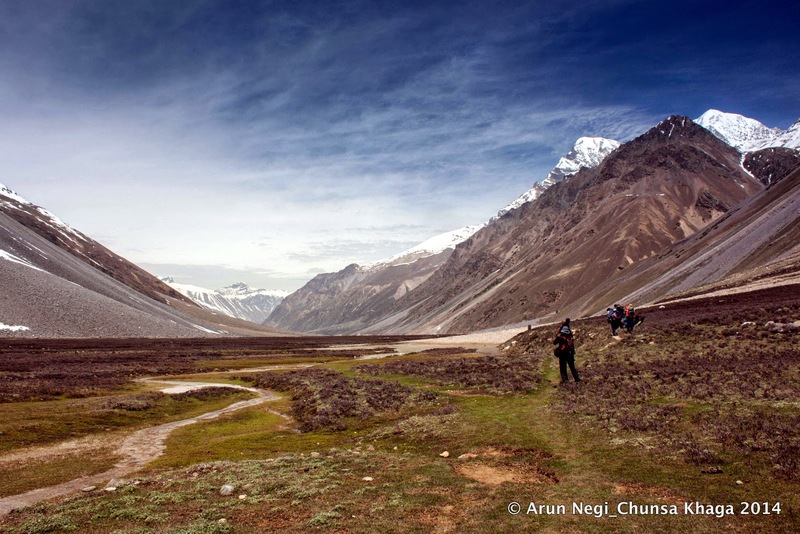 We were targeting a long march to Chitkul next day; a gradual descent with couple of tricky patches over 21 kilometers. Some of us grumbled a bit about the march but eventually came round to the fact that there was no point camping in Ranikanda with the road head of Chitkul just 2 hours away. 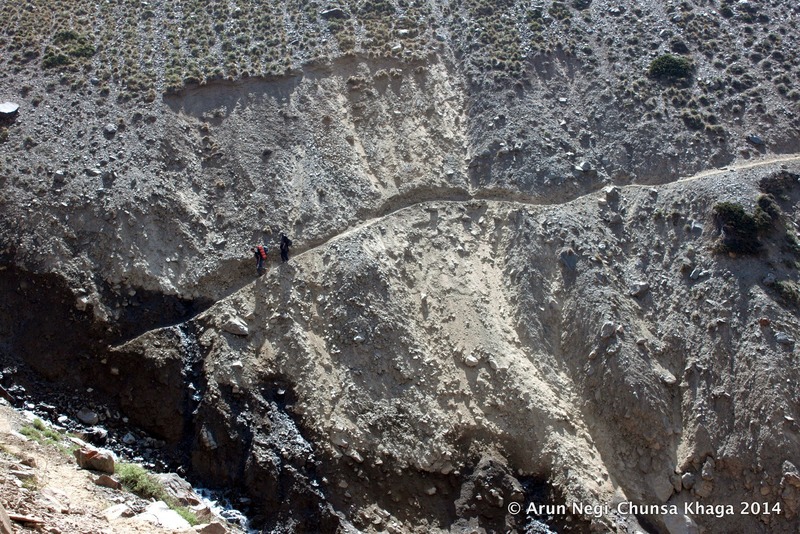 Immediately after Dumti, the trail winds along some exposed and broken slopes of loose scree, which require extreme care. The view of the angry waters of the Baspa, foaming almost vertically below, is not a comfortable sight. About two kilometers before Ranikanda one crosses the craggy and exposed sides of mountain of red-rocks, famously known as “Lal Dhang”- The Red Hill. The rusting slabs on the trail confirm our suspicion that it is actually a mountain of red hematite- iron ore! Couple of ITBP Jawans were waiting with tea as we approached the point where a bridge across the river leads one over to the left bank where the Ranikanda post is located. The post is at one end of a massive meadow that extends for about two miles upstream. As we approached the Doaria CG, the lovely meadow on right bank opposite the valley coming from Borasu Pass, we saw a large number of ITBP and Army men moving into the valley for exercise. Soldiers and shepherds alike gave us the look of utter incredulity when we told them where we were coming from. “ हाँ चूंसा खागा! हमने भी सुना है. कैसा रास्ता है?” said one of the Chitkul shepherds as he fell into step with me on the winding trail from Doaria Meadows to Nagasthi. After a final regrouping, refreshments and photo-op with jawans of ITBP Nagasthi we set off one our last leg to Chitkul. 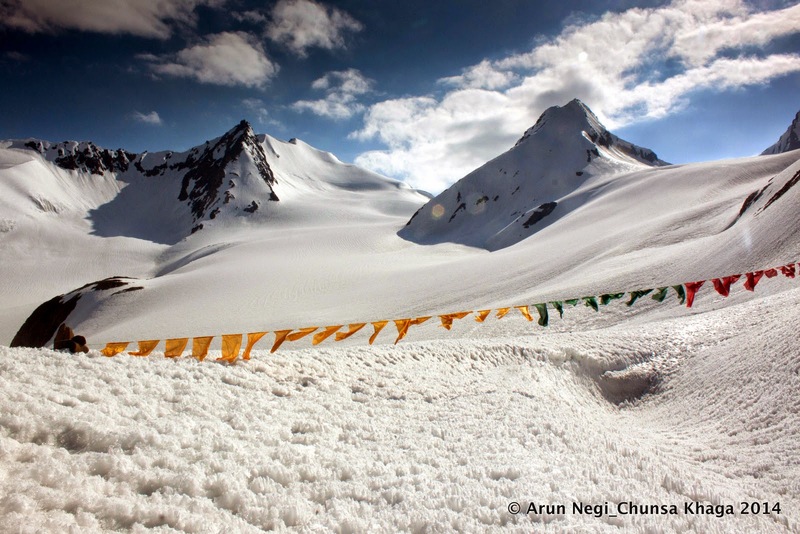 It was 1530, seven straight hours and 21 Kilometers of hard march out of Dumti, when we reached the Chitkul Bus Stand. The drive down to Sangla and then the long drive back to Delhi the next day, were largely uneventful. What I do remember vividly though is the spectacular course of the Satluj and the marvellous road engineering at the scary Taranda gorge on the drive down the district of Kinnaur. The valley of Satluj is spectacular and awe inspiring. Her torrents are way ferocious compared to the fiercest form of the Ganga or the Yamuna. The volume, turbulence and muddiness of her waters tell the story of her long descent from the arid Trans-Himlayas. I made a mental note for future explorations along her valleys- perhaps The Tedong? Or the Gymthing ? The allure of many ancient trails, of Shimdong La and Khimokul La, beacon strong as I read more about this wild river. Thus ended our third visit into the valley of the Jahnavi. Instead of satiating the thirst, this journey only deepened it further. The watershed with her many dimensions creates some sort of a magnetic pull. Whether the mighty mountain allows that foray into the last valleys of Tirpani and Nilapani will be seen in due course of time.